Solar or Geo Thermal glass lined tank for pre-heat with internal bottom heat exchanger + 4.5 Kw Heating Element . UL and CSA certified. 6 year warranty. 119 gallons. Solar water tanks are used in solar hot water systems to act as buffer energy storage. 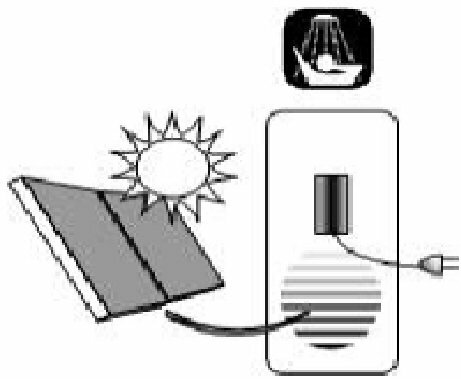 When the sun is shining, the water will be heated in the storage tank for later use, most commonly in the evening. 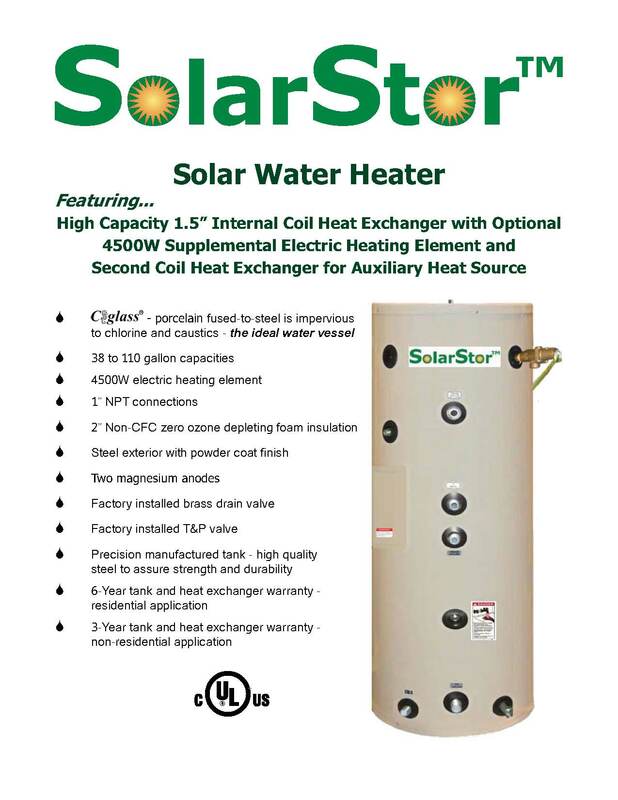 Most solar water tanks contain a heat exchanger to seperate the potable water from the solar heating solution (Water/Glycol), and have a great insulation value that can retain the heat for days. They are also popular in Geothermal systems for those with Desuperheater, where by the hot air removed from the house (air conditioner) is transferred to the hot water tank to use in the home. When sizing a hot water storage tank you need to consider two important variables. First, how much draw is used per person in the house? An average household will consume 20-30 gallons per person. This includes shower & bath water, dishes, and laundry. So a family of two will normally require a 40 gallon storage tank at a minimum. Secondly, for each gallon of hot water you need the same number of square feet of collector area.It is very important that you do not exceed this number or you will find that in peak summer months your solar system may reach extreme temperature. It is better to have a system that is under powered than over powered. Our TZ58/1800-30R solar evacuated tubes have a gross area of 40 ft2, so for each collector you will need minimum 40 gallons of storage. 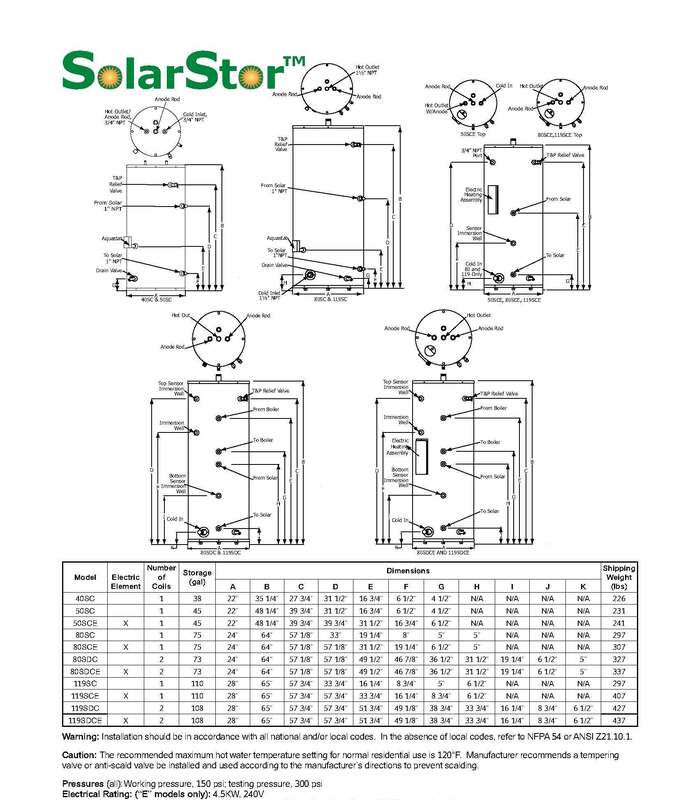 The 1st and most common tank system is a Solar pre-heat tank. This type of solar heating system is used in homes with an existing water heater (electric, oil, gas, tank-less). 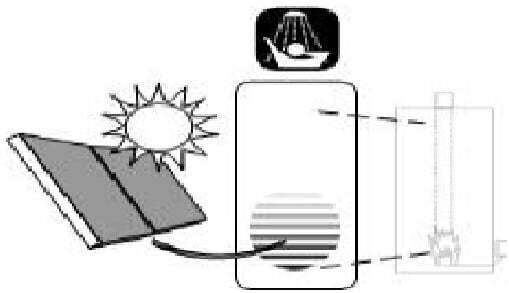 The pre-heat tank stores the solar heated hot water which is then drawn into the main tank when the hot water faucets are opened. This type of system uses an internal heat exchanger that transfers the energy from the solar loop to the potable water. In this way ground or main line water of approx 35° F can be preheated to say 120° F+ degrees before entering the primary heating tank. If the heating tank is set to 130 degrees it only needs to raise the water 10 degrees instead of the 95 degrees it would have otherwise had to with out the solar pre heat tank. We feel that being honest is a much better policy to win your trust rather than trying to lure you with nearly impossible statements such as lifetime warranty. Nothing lasts forever! Our warranty policy is simple; we offer a 3 year warranty on everything we sell and 10 years on our collectors. With this warranty you will get NO hassle next business day replacement (if shipping service and inventory permits). However, as a valued customer you will get technical support through the lifetime ownership of your product. Our Collector do carry longer warranties 10 years from the manufacture. The warranty cover failures that occur during normal operational conditions or manufactures defects. It does not cover failure due to inappropriate operation such as freezing or over heat. Damage caused by vandalism, storms, floods etc. Your houshold insurance should be modified to cover the system from such situations. This product was added to our catalog on Wednesday 13 August, 2014.